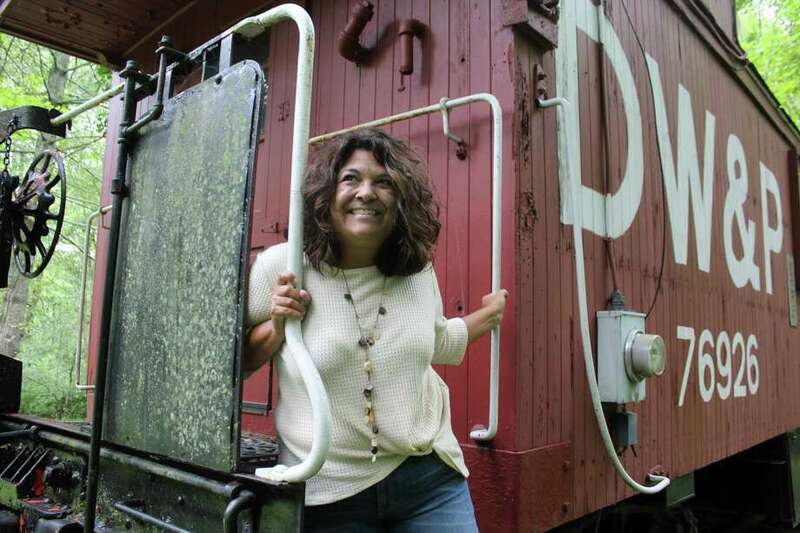 Film and television writer, teacher, and instructor Gigi New stands outside her caboose office at her Westport home on Sept. 7. WESTPORT — Hollywood is finally catching up to GiGi New. New, a Westport resident and film and television writer has several movies and a television show currently in production all of which center characters — young minority women and a widow, who don’t fit the industry's traditional mold for leading ladies. In fact, New’s transition from actress to film and television writer was precipitated by her frustration with the industry’s lack of diversity. “I got a little disillusioned with acting. I loved it, but I just thought, if this is what it’s going to be, basically who fits the suit, this isn’t the best use of my creative endeavors,” New, who’s of Panamanian and Italian descent, said. A self-proclaimed military brat, New, 53, grew up all over the country but said she calls Virginia, where she graduated from Virginia Commonwealth University with a theater degree, home. As a young kid New fell in love with acting through community theater and after college moved to Chicago to join the city’s robust theater scene. “I was torn as to New York or Los Angeles, so I decided to split it right up the middle and go to Chicago,” New said. In Chicago, New did some theater but largely pressed the pause button on her acting career. Unexpectedly, learned the most in Chicago from her work as a comedy club cocktail waitress, which she needed to pay rent. “I was really enchanted with the comedians who worked at it, who didn’t just try for a simple or a cheap laugh,” New said, noting she came into contact with many comedians on the rise through her waitress work. After six years in Chicago and equipped with an astute ear for comedy, New moved to Los Angeles, where she found some work in plays and auditioned for television shows and the occasional movie, but didn’t land any roles necessary to justify an acting career, in part because of the lack of diverse roles in Hollywood. A few years into her time in Los Angeles, New had put the breaks on her acting career and was trying to figure out what to do next when she met her now husband, actor Nicholas Sadler, at a bar in the city. New recognized Sadler from movies such as Scent of a Woman, Twister, and Disclosure, and the two began talking. Encouraged by Nick, New wrote the story, and went even further, writing a Cinderella-story type movie that she passed on to a friend, who passed the script onto an agent. “The agent loved it and all the sudden I’m getting meetings all over town,” New said. Although New’s script was never produced, the connections she made helped her get work as a writer’s assistant on Everybody Loves Raymond and later as a writer on the Nickelodeon show The Brothers García and Fox’s program The Ortegas. “I found creativity is not compartmentalized. You don’t just have talent in one area. Generally, it filers into something else and I found that through all my years acting, I had a nice ability to tell a story and especially a nice ear for dialogue,” New said. After New and Sadler’s son Cooper, now 12, was born, they reconsidered Los Angeles. “When he was born, Nick and I knew we wanted to head back to the East Coast, for nothing more than to give him a more steady lifestyle and an education where we didn’t have to put him in private school,” New said. The family moved to New Canaan for five years before relocating two years ago to Westport, drawn to the town’s artist community, strong theater education for Cooper, and beach access. These days, New primarily works on her own creative projects out of the repurposed train caboose a previous owner of her home installed on the property. She also helps other film and television writers as a writing instructor at the Westport Writers Workshop and as a writing consultant. The television show script, which is set in Westport, poured out of her, New said, noting the rise of television streaming and Netflix and increased appetite for previously underrepresented characters may bode well for the show’s production. “My golden chalice person would be Anne Hathaway,” New said of her choice person, a fellow Westport resident, to play the widow role. “If she reads this, maybe she’ll call me,” New added.